At a mere five mana total, Dragonlord Ojutai is the cheapest of the Tarkir Elder Dragons (or any Elder Dragon, for that matter), but that does not mean he’s weak. With flying and built-in hexproof, he’s both evasive and difficult to remove, and he casts an Anticipate every time he hits someone. In short, Dragonlord Ojutai is a true package deal and very much a steal at five mana. 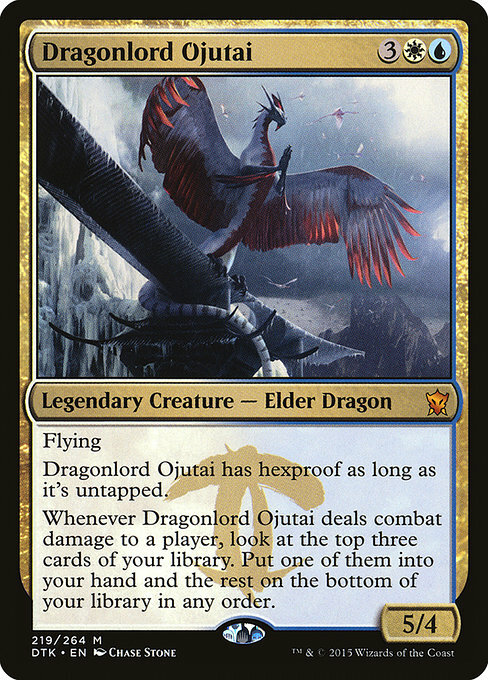 Dragonlord Ojutai is also very near and dear to my heart for two other reasons: first of all, he is my all-time favorite commander to play, and my own deck built around him is the one I’ve played the longest. For more than two years now, Dragonlord Ojutai and I have been battling it out in my local meta, often against my friend’s Dragonlord Atarka deck. I recently went abroad, visiting the Netherlands and specifically a game store in Eindhoven, and naturally played with my deck using my custom play mat. 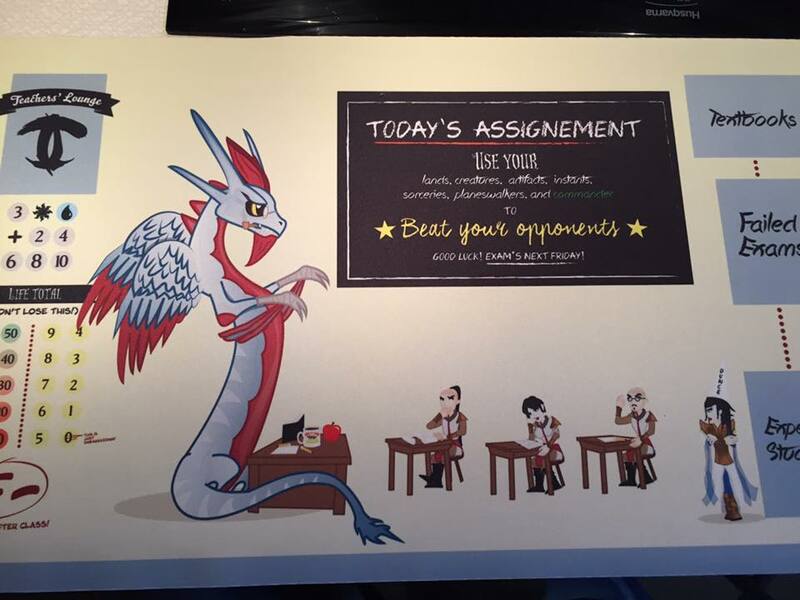 The second reason I love this commander in particular is that both Dragonlord Ojutai and I are teachers – though while he might cultivate the magical prowess of his prodigal students, I teach English as a second language and religious studies in an upper-secondary school. The basic principles of pedagogy is still the same though, I’d wager. All of this means that I was really excited when reader Rick sent in his Dragonlord Ojutai deck as a patient for this series; not only could I use the powerful EDHREC tools to tinker with his deck, I also have a lot of personal experience with the commander in question. At first glance it might look like Dragonlord Ojutai makes for a linear strategy, but the truth is more complex. I will elaborate on this after we’ve had a look at our patient this week! In order to discuss Rick’s decklist, I want to provide a link to my own take on Dragonlord Ojutai: click for link. In my view, Dragonlord Ojutai lends himself to two different types of strategies, and he tends to do both quite well when helming a deck fitted for the occasion. 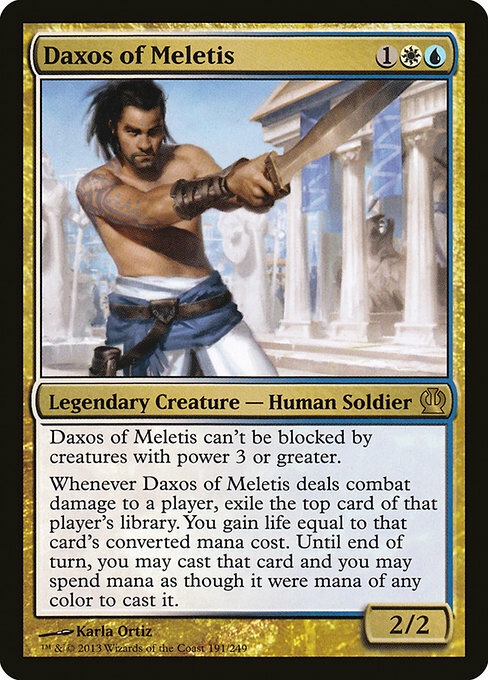 He can either go classic blue/white control with your standard package of removal, countermagic, card-draw, and sweepers, using the commander as a finisher and occasional card engine, or he can go pretty aggressive voltron with cards designed to make use of his hexproof ability as well as more than decent stats in general. 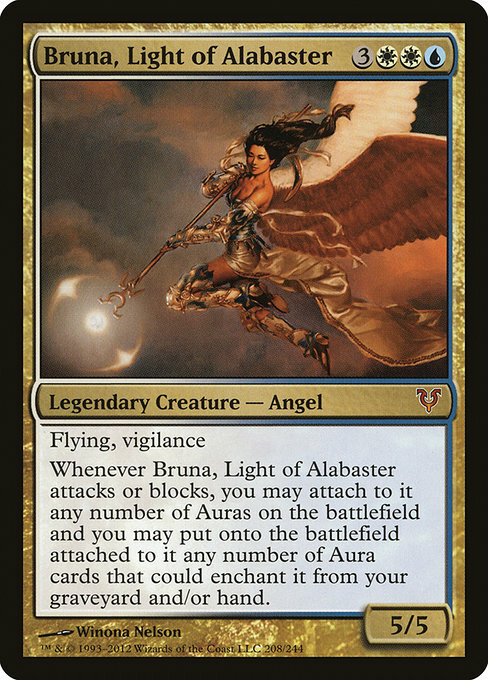 The problem is that while Dragonlord Ojutai is a fine commander for control, Grand Arbiter Augustin IV is probably better in that role, and while Dragonlord Ojutai is fearsome with the right auras or equipments on him, Bruna, Light of Alabaster and Daxos of Meletis are there to challenge the Elder Dragon for the spot as the commander of a blue/white voltron build. One way to solve this is to approach the deck using a mix of control and voltron – we could regard these two strategies as two extremes on a spectrum, and Dragonlord Ojutai should end up somewhere in between. Which end your deck leans towards depends on your local metagame, your playstyle, and your personal preference. My own Dragonlord Ojutai deck started off as a “teacher theme” deck where I had a lot of cards referencing teaching, knowledge, books, pupils, etcetera – but the problem was that while the deck felt like a pretty coherent deck (a rare case when it comes to my theme decks), the theme didn’t really shine through. 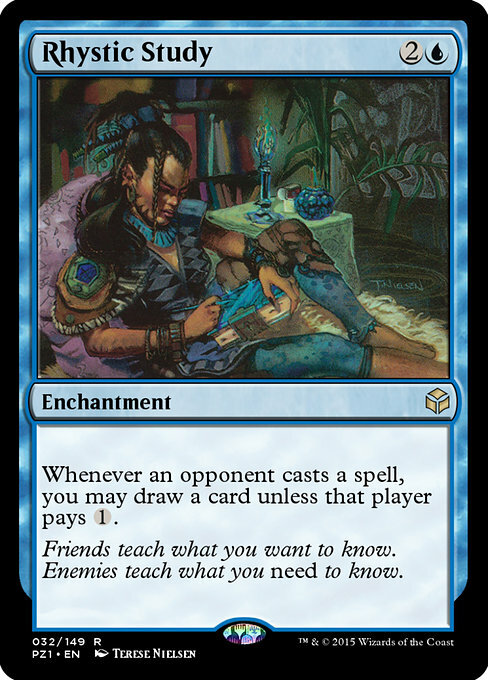 Rhystic Study, Mystical Tutor, and Compulsive Research might all reference teaching or learning in one way, but they are also format staples for a very good reason – they’re all great EDH cards. This, together with the fact that my metagame has gone more cutthroat over the course of the past two years means that nowadays my deck is the best build for my meta, my play style, and my card pool (still missing that Mana Drain). A few more flavor-justified choices are still in the deck though – Ojutai Monument just isn’t a very good mana rock at the end of the day, and while Ugin’s Insight is a fine card draw spell, it’s in the deck not because there aren’t better choices but because Ugin is quite clearly showing Jace a PowerPoint presentation in the artwork. Rick’s build leans more towards the voltron end of the spectrum, which is perfectly fine, of course. His deck has a large number of artifacts, and most are present to help out the commander with his teaching duties, that is, teaching our opponents lessons they will never forget! My friend Jessie also plays Dragonlord Ojutai and his decklist is more in line with Rick’s list – you can see Jessie’s deck here (click!). For the sake of this surgery, we’re going to approach the deck from the more voltron angle, but as Rick writes himself – we need to consider a metagame with combo decks and swarm decks, and we will regard those as well. Overall, we’re missing a few ways to draw cards, and we’re missing enough ramp and lands to be able to cast our spells in time, both of these factors are necessary when trying to keep up with a table, whether you’re on the control plan or on the voltron plan. A couple of things stick out with Rick’s list, and the suggestions from this site echo my preliminary analysis: we’re missing Azorius Signet for example, which is fantastic and a natural format staple. We’re missing Rhystic Study which in my experience tends to get removed but sometimes has those games where you get to draw ten cards for three mana. We’re missing Dig Through Time which is no less than fantastic card selection and card draw, all rolled into a nice instant package. Probably the best suggestion from the site is Sword of Vengeance. Though expensive, Sword of Vengeance does everything we want in the deck: it gives Dragonlord Ojutai vigilance which is the biggest selling point, it gets him to 7 power which is the optimal threshold for killing via commander damage, and it also gives him both first strike and trample, meaning all but the biggest flying blockers will be mercilessly trampled over, in the air no less, and Dragonlord Ojutai will get through to get that Anticipate. I looked through the top 100 creatures in decks analysed by EDHREC, and out of all of these 100 creatures, only Avacyn, Angel of Hope can block profitably against Dragonlord Ojutai with Sword of Vengeance. 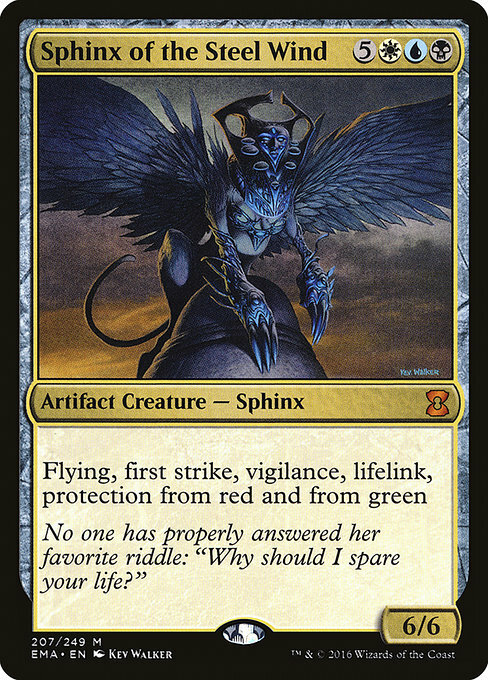 Sphinx of the Steel Wind will trade as well, since it too has first strike. The rest can either not touch Dragonlord Ojutai at all, or can only chump block away a few points of damage. 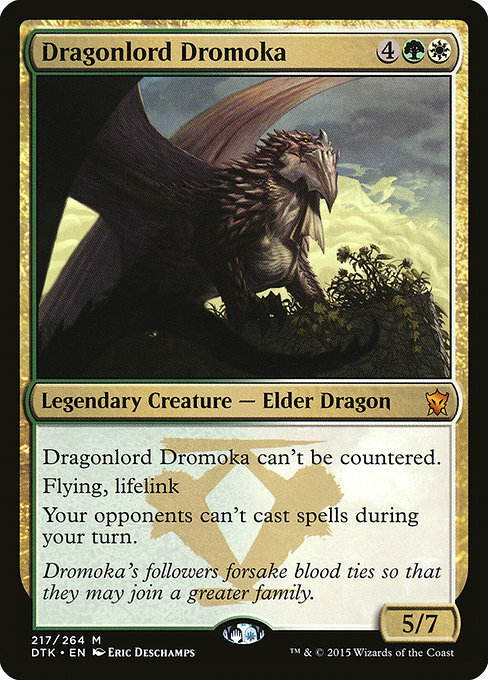 The only one not letting any damage through for the trigger is Dragonlord Dromoka, but she too will just chump for a single turn. EDHREC suggests more card draw than Dig Through Time and Rhystic Study and we’re going to jam as much of it in the deck as we can – top contenders are Fact or Fiction, Treasure Cruise, and Consecrated Sphinx. I can certainly see arguments for smoothing out the game plan with the classic cantrips of Brainstorm, Preordain, Ponder and so on, but I find that it’s difficult to find room for these spells when manipulating the top of our library isn’t exactly central to our game plan. We’re getting cards from there, sure, but we’re not casting spells from it à la Rashmi, Eternities Crafter or Maelstrom Wanderer. 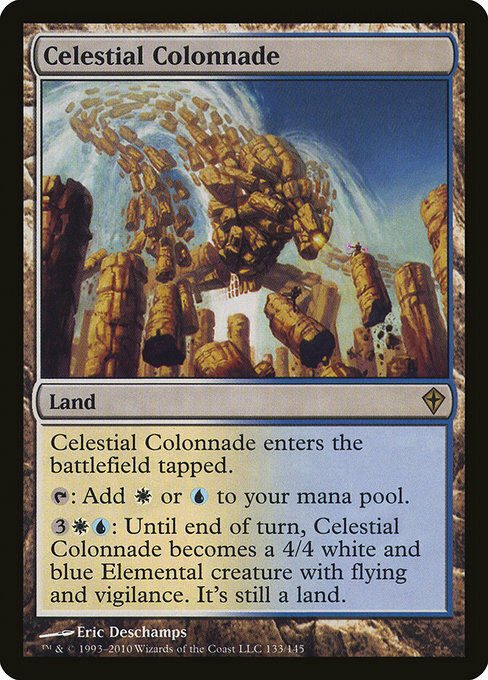 A card suggested quite early by EDHREC is Celestial Colonnade. This little folk land is getting ridiculously expensive these days – at the time of writing it’s over $50, but it certainly has a room in this deck. 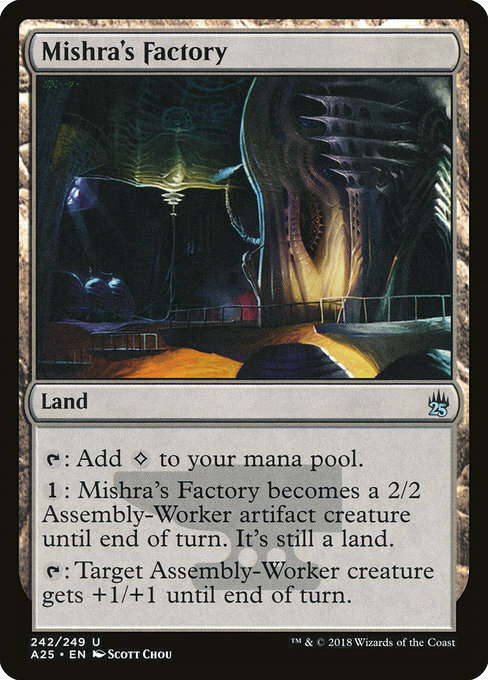 In fact, I would like to suggest more available folk lands for the deck – primarily Mutavault and Mishra’s Factory but even Blinkmoth Nexus and Faerie Conclave could find their way into the deck. There are several reasons for why I advocate running these lands in this deck: the obvious reason is that they are good spares for when our commander gets removed and we need to swing for the last few points of damage, or block, or kill a planeswalker for example. 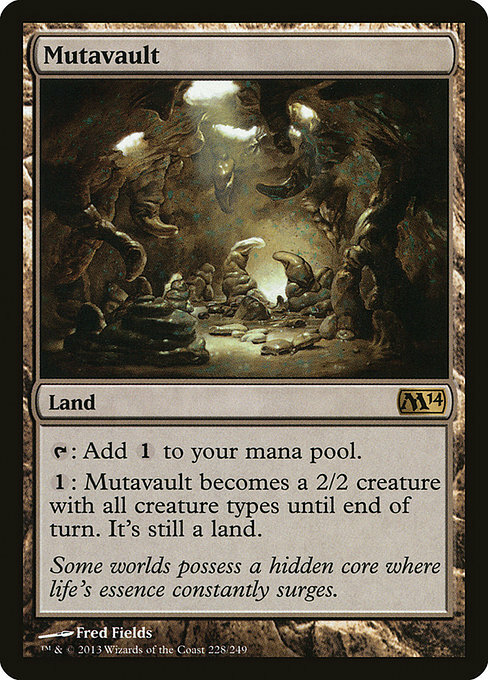 Though mana-inefficient, these folk lands tend to be a lot harder to remove than regular creatures since sorcery-speed sweepers won’t touch them, and the window for removing them with other means is shorter than with regular creatures. Another, for this deck very important, reason to play these lands is that they are excellent defense against Dragonlord Ojutai’s biggest enemy: sacrifice effects in the style of Fleshbag Marauder. 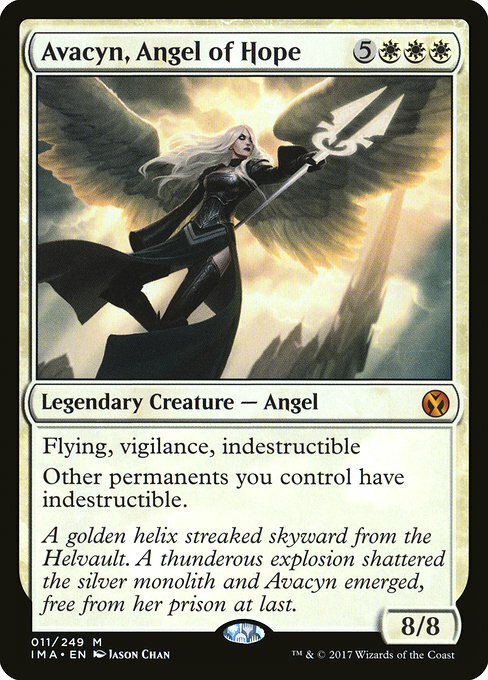 Another notable exclusion from Rick’s deck and which doesn’t show up very early in EDHREC’s suggestions are the conditional sweepers of Divine Reckoning and Tragic Arrogance. The former permits everyone to keep their best creature which might be bad in some metas, but it might be worth consideration if you’re in a meta game with a lot of token or swarm strategies that like to go wide. Tragic Arrogance is fantastically unfair and many opponents tend to read it twice before they realize just that. It’s definitely worth playing in this deck, since resolving it means we get to keep our huge dragon with whatever piece of aura and/or equipment is best at the moment, and everyone else is stuck with the worst of everything they have. The cuts are quite difficult to make this time around – Rick’s deck is fairly streamlined as-is, but there are improvements to make. I’ve focused on cutting cards that might not do enough in the deck, but aren’t bad cards per-se. Imprisoned in the Moon is a fine, but pretty narrow card. It turns off opposing commanders sometimes, but in my experience it just doesn’t do enough. Haunted Cloak and Sword of Light and Shadow are both neat equipments, but Haunted Cloak is a bit too weak for the price and there are too few creatures left in the deck to make proper use of Sword of Light and Shadow’s triggers – though the protection is nice indeed. 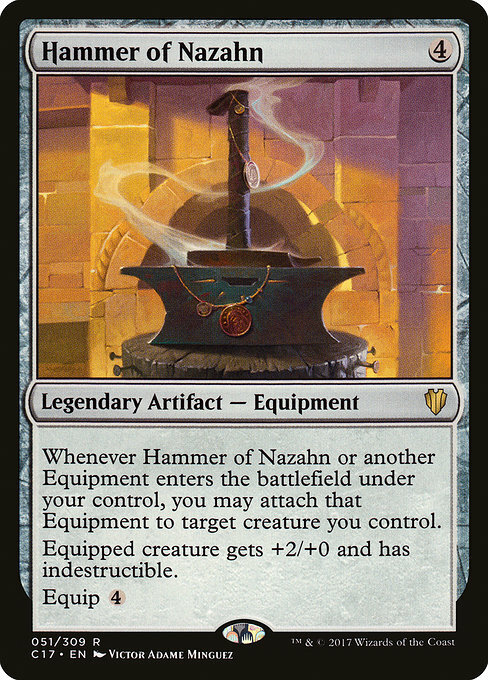 Darksteel Plate is powerful, but Hammer of Nazahn brings the important indestructability while also pumping Dragonlord Ojutai to the important 7 power. 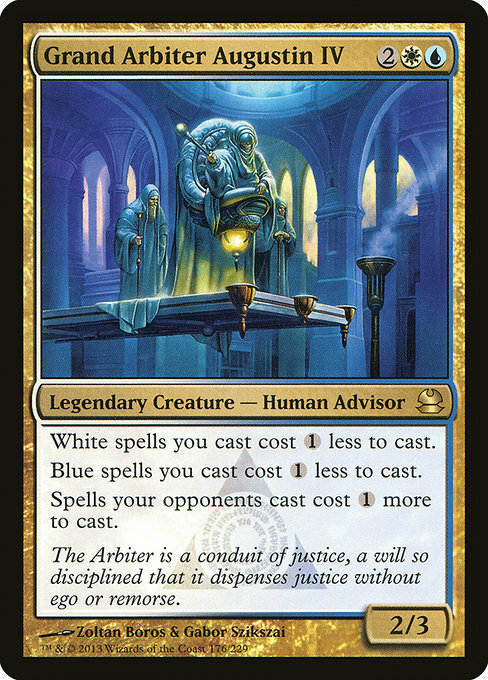 Azor, the Lawbringer, Grand Arbiter Augustin IV and Monastery Mentor are excellent creatures in their own right, but the deck doesn’t support them enough with its strategy to warrant their inclusions. Forsake the Worldly is nice in that it is flexible, but not powerful enough since we don’t want to trade one-for-one too much in this format, and while Fumigate is nice especially in a meta full of swarm decks, Tragic Arrogance is great against them as well, while leaving us with our best things and our opponents with their worst. Tezzeret the Seeker is a planeswalker and thus very vulnerable, but also extremely powerful in a deck like this – able to tutor for anything we could want in vigilance enablers among our equipment, untapping mana rocks, and so on. In Other options, I’ve left some of the more expensive things, as well as some of the less-than-obvious inclusions. Forebear’s Blade is more often than not just a worse version of Sword of Vengeance in this deck, Avarice Amulet and Angelic Field Marshal are both nice for vigilance and the power boost, but each has their own issues. The countermagic could be warranted of combo becomes a bigger part of the metagame, and Dragonlord Ojutai is one of the commanders who can combat the card disadvantage from Force of Will well. With these changes, we’re left with this deck. The deck has a fair bit more card draw than it previously did, and will thus operate more efficiently in the games where we’re unable to get our commander up and running early on. 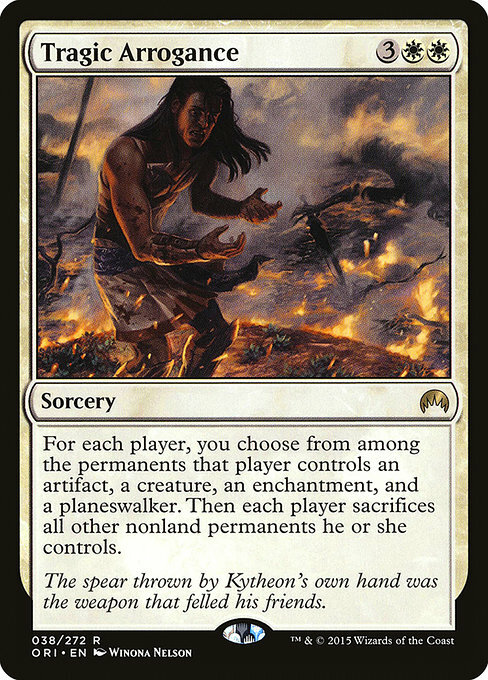 I’ve removed cards that don’t do enough and replaced them with singularly more powerful pieces, meaning that the deck tends to topdeck better than it used to, which is a small gain, but can be significant in games that grind to a halt (which, as we all know, EDH games tend to do). I would lastly like to mention Savor the Moment which doesn’t really convince me – if we have enough things in play to cast Dragonlord Ojutai and things to go with him (which is when Savor the Moment is good), we have enough mana to cast Time Warp. It is awesome and odd enough to keep, however. I hope Rick can take some of my advice to heart and improve upon his deck, and I also hope that you, dear reader, have enjoyed this delve into the strategies of The Great Teacher. What cards did I miss out? Leave a comment below, and let’s all help Rick out with his deck! General Medicine is a bi-weekly column where I take a look at your EDH deck, run it through our own EDHREC analysis, add some twists and turns of my own, and present your deck with an analysis for the world to see, right here on this site! Sounds exciting? Want your sweet brew featured (as in, picked apart, analyzed, and written about – it’s not as scary as it might sound!) in my series? An easy to read decklist. Links to the usual suspects (TappedOut, Deckstats, etc.) is fine. A short description of where you want to go with the deck – is it competitive? 75%? Casual?